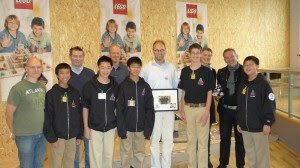 As part of the MoonBots-Google Lunar X PRIZE LEGO MINDSTORMS Challenge, First Place Team Landroids received their GRAND PRIZE and visited LEGO Headquarters in Billund Denmark. Thanks to their Team Captain, he has shared with X PRIZE details about his team’s experience! Day One: Our group boarded the 10-hour flight to Billund, Denmark. On the flight to Billund, the airline had insisted that our precious Moonbots robot be checked in as a luggage. With a graceful toss of our carry on suitcase onto the cargo cart, we sweat through the agony of the robot being damaged. Good thing everything looked fine. The team was promptly picked up to tour the LEGO Idea Museum and learn about the origin and history of the company. Started as a one-man wooden toy maker in the 1940’s, to an international success today, we learned about the LEGO history, and how it has gotten its name as “Leg Godt” which means “Play Well” and also means “I put together” in Latin. The Landroids were impressed by the LEGO company motto, “Only the best is good enough”. Later in the day, the team browsed though the LEGO Museum, finding many childhood models that are no longer in production, which brought back much memories. Day Two: This was the most exciting and nervous morning of all! The Landroids arrived at the LEGO headquarters with only 2 hours to set up the Moonbots field and test the robot. The team got to meet and chat with the MINDSTORMS developers during this time regarding the programming and design process. All the while the robot was having problems even with the first mission, couldn’t calibrate the compass sensor to a brand new Moonscape in a different orientation. We had just enough time to do three quick on-the-spot program adjustments, since each LabView compilation took about 15 minutes each time. Promptly at 11 AM, the LEGO Group CEO, arrived to meet the team, and to watch the MoonBots robot run. Landroids’ lead programmer and robot designer calmly presented the robot design to a roomful of executives and the CEO, then put the robot down and let it ran through its full course. Many of us were holding our breaths and praying secretly. Luckily, the robot behaved quite well considering, picked up 50% of the loops but completed all other missions. When the CEO asked us what was the most stressful moment during the MoonBots season, we replied “Now”, and got a roomful of laughter. The CEO gave each of the member a LEGO Space Shuttle model, plus bags of LEGO gadgets. After lunch with the MINDSTORMS designers, we visited the LEGO factories. We noticed that almost everything was recycled, reused, or reclaimed, with minimal waste. The level of precision and quality control were impressive! After the tour, we all had a newfound respect on how intricate and time consuming it was to assemble and print one LEGO figurine. Day Three: Our team got to visit the World Robotics Olympiad finale at the Aarhus University. 15 high school teams were working intensively through rounds of competition, to see which robot was the fastest in climbing two separate poles and knocked down the ping-pong ball that was perched on each pole. The Landroids were happily roaming around as spectators with no pressure this time. Day Four: Going home today, this trip seems long and yet it was too short. Thank you to the LEGO Group and everyone from MoonBots for this amazing opportunity! We just couldn’t believe how many man-hours and personnel it took to plan this trip and to give our team the VIP tours and treats everywhere. This was above a beyond what we had expected! For more details about this experience, please visit Team Landroids' website.